“Well, thanks for trusting me enough to admit that,” I replied. I looked over at my daughter, wondering if she ever felt that way. The expression on her face confirmed that she did. Talk about an a-ha parenting moment! Your primary job as a parent is to love your teen and prepare them for life, which means that you naturally enforce boundaries. It makes sense that your kids might hesitate to tell you things that they anticipate will get them into trouble. But not telling you something because of fear of how you will react…that’s a different issue. Your teen fears your emotional reaction because she loves you and doesn’t want to disappoint you. She also has something deeply important to share, and she needs that conversation to be about her emotional reaction, not yours. Here’s what I learned: With a few communication adjustments, you can ensure that your child will feel safer having hard conversations with you. Keep a neutral but warm expression on your face. 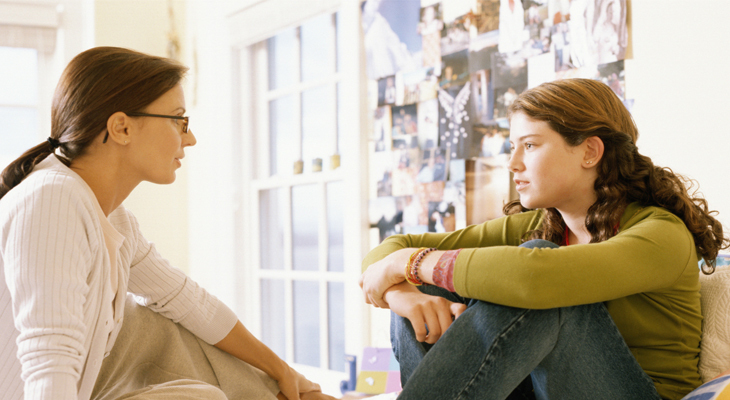 With your nonverbal behavior, try to communicate love and acceptance of your teen, even if what she tells you is concerning. Finally, if the situation calls for it, communicate your values or enforce discipline. It might take some practice, but over time you will begin to see that those hard conversations will meet your teen’s needs for building trust and developing healthy emotional intimacy. She will naturally reach out to you more. And how awesome that you, Mama, helped her develop rock solid skills for her future relationships—whether they be with her friends, her spouse, her work colleagues, or even her own children—in those hard conversations.